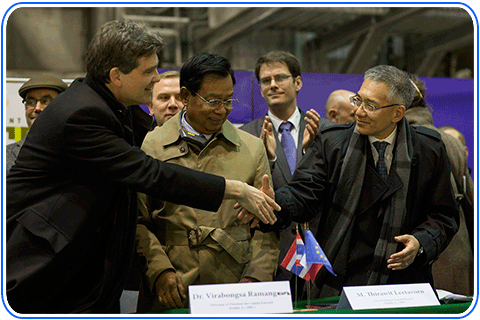 Mr. Arnaud Montebourg, France’s Minister for Industrial Renewal (left) congratulates Mr. Thirawit Leetavorn, Double A Senior Executive Vice President (right), after signing the agreement to finalize the acquisition of Alizay pulp and paper mill in France. The signing ceremony was attended by Double A executives, French government representatives and local and national media. Bangkok, Thailand – Double A premium paper maker from Thailand has recently acquired a pulp and paper mill facility in northern France from the French government agency, Eure. Double A will restart the operations to serve its European customers including neighboring countries. The Alizay mill has a combined pulp and paper production capacity of 300,000 mt per year. This investment represents Double A’s ongoing commitment to growing the brand and supporting its European customers. “This investment will open opportunities for Double A in Europe. Paper from Alizay will enhance our brand strength and allow Double A to be responsive to our customers’ needs”, said Mr. Thirawit Leetavorn, Double A Senior Executive Vice President. The Alizay mill opportunity and its restart was made possible with the dedication, work and cooperation of the French Embassy in Thailand, headed by the Ambassador of France to Thailand, His Excellency Mr. Thierry VITEAU and his capable staff. The Double A Alizay Mill will provide continued employment of up to 200 skilled paper making French nationals and play a key role in sustaining the local economy. The Double A Alizay paper mill will be using two types of raw materials – first is virgin short fiber raw material from sustainable Paper from KHAN-NA which will be used for Double A paper production and the second one is recycled fiber for the production of the paper brand Evolve. The short fiber from Paper from KHAN-NA will be supplied by Double A Thailand. This will ensure the sustainability of the fiber source and secure the quality of paper to be manufactured at Alizay will be at par with the Double A quality trusted by consumers in 120 countries worldwide.